Taupe: A traditional color range with a wavy lines design for a bathroom rug. The range of colors include taupe / medium greyish brown with deep brown. 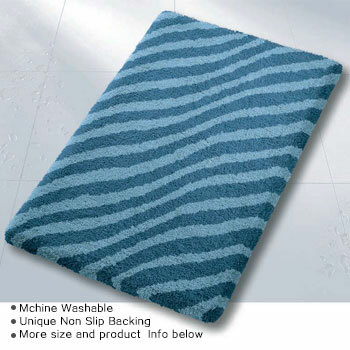 Ice Blue: Affordable low pile bath rug that will bring the ocean into your bathroom. The range of blues include a royal blue and sky blue. Plantium: Gorgeous, fun and unique gray bathroom rug. The range of colors include platinum grey with dark anthracite grey lines.